ANXM was great. I’ll admit I’m not a big fan of Evan. Primarily because I absolutely loathed Aaron’s WatXM. Evan was probably the best-written character in that series, but just the same, I couldn’t enjoy that series. But I do think he’s a good character, and I think Hopeless does fantastic work with the character here. He explores the character in a way that hasn’t really been done before. We’ve gotten plenty of stories that were all about the tension of whether he would become Apocalypse again. But this one explores him in a much quieter way, which I don’t think has been done. It’s not about whether he’ll become a villain. It’s about why he is the way he is. So I like what Hopeless did with him here. And, of course, Bagley does not do bad work. So it’s a gorgeous comic. By the way, the baseball bat actually originated from the Astonishing Spider-Man & Wolverine mini, by Jason Aaron and Adam Kubert. A series that features Wolverine shooting Doom the Living Planet with a Phoenix Gun. So, you know, probably something that would be up your alley. It is a really good mini. Even aside from that kind of ridiculousness, there’s some excellent dramatic stuff in there. I think the scene in Egypt was set at night to hide the identity of Kid Apocalypse I until the last page reveal, so everyone looked kind of grey. But it is also a nice callback to the 70s and 80s when for some inexplicable reason Marvel coloured all Arabic characters with grey skin. Further, I’m wondering if the point of this is to show that Kid Apocalypse I was also a nice-ish guy who didn’t want to kill people, but still turned into what he turned into. So all Evan’s efforts to be a nice guy may be wasted. It seemed to me like Hopeless used Evan’s memories vs the reality of the town to contrast the classic Superman ideal of small town life vs the prejudices all too common in our actual Midwest (and most everywhere else to varying degrees). As much as I love classic Superman, I appreciated that a lot. 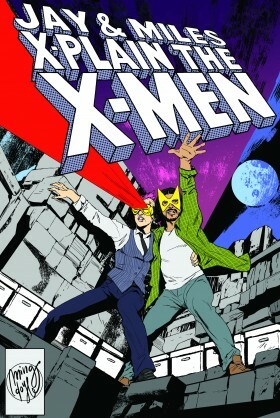 And Al Ewing’s Ultimates #6 may just explain why the original X-Men are from the 1960s. I’ve been listening to the podcast off and on, catching up, and between the constant Silent Hill references, name-dropping Wraith: The Oblivion, the X-Men thing, and the general video game knowledge, I am consistently astounded at how we appear to have had most of the same childhood. Now you bring up The Last Supper, a movie that I was fairly confident no one else had ever seen. This is getting sort of eerie.